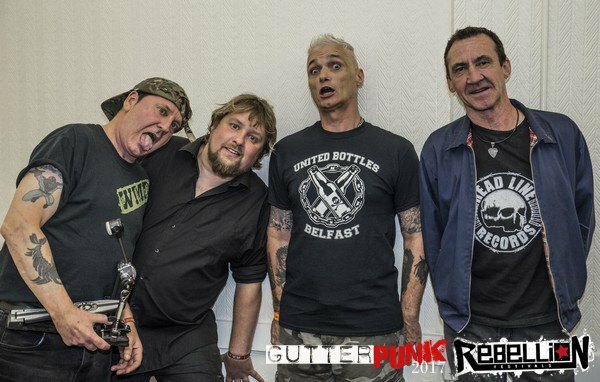 It’s often the case that the bands we remember from the early days of punk attempt to make come-backs, reunions and nostalgic tours, and when they do, it’s with very mixed results. Belfast boys The Defects however never really went away – constantly making music and ever active in the wonderful scene the city has. So here we are with ‘Feed The Good Dog’ hot on the heels of 2015’s (patchy at best) ’45 Minutes’ and straight from the off it’s clear where this album’s roots and message lie, targeting a new set of injustices, Buck and the boys launch into ‘Another Broken Promise’ and it’s huge! Politicians seem to be the main villains on this record (and rightly so) with absolutely everything cranked up to maximum – Roy McAllister’s guitar sound across the whole record is incredible. Coupled with Buck Defect’s trademark staccato delivery, it’s a thrill packed 30 mins of an album with choruses that instantly get stuck in your head and are destined to be shouted back at the band from pits across the country this year. The majority of the subject matter is the current state of the world but there are the odd little diversions like ‘Gate Crash’ which is the natural companion to 2013’s ‘Hill Street’ with its tale of party nights past. Another stand out is ’30 Billion Dollar Swindle’ which delves into moon-landing conspiracies and has a very clever Neil Armstrong sample woven into the chorus – it’s terrific listening. I always rated ‘Politicophobia’ as their best work until this little gem landed. It’s rarely been off my playlist over the past few weeks and I can honestly say it’s made a early bid for my album of 2018. Check it out, you won’t regret it.